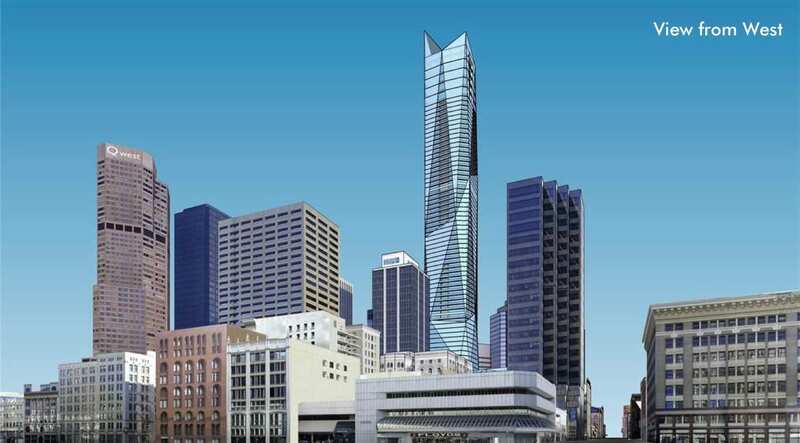 A preliminary concept plan for a 1,000-foot tower that looks like will not be built at 650 17th St. Image credit: Davis Partnership Architects. The deal for an 81-story, 1,000-foot skyscraper proposed to be developed in the heart of downtown Denver is dead, the owner of the land said Thursday afternoon. 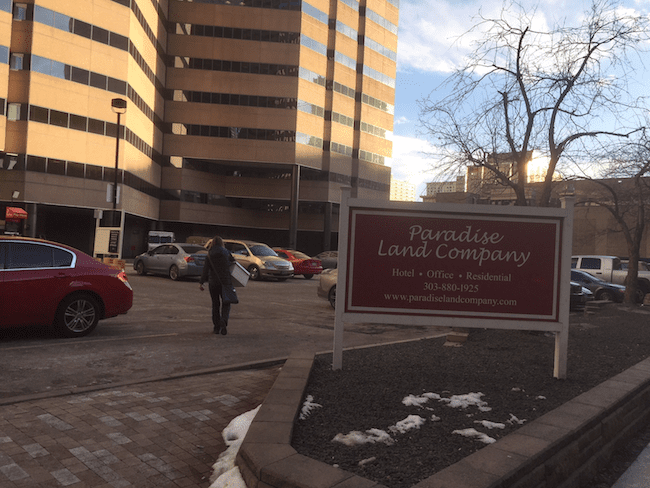 Buzz Geller, whose Paradise Land Co. is the owner of the 25,047-square-foot parcel at 1650 17th St., said he has put the land back on the market for $17.5 million. That is a bit more than New York-based Greenwich Realty Capital had agreed to pay for the parcel, Geller said. A non-disclosure agreement prohibits him from publicly discussing the sales price of the previous deal. One of the prospective buyers is from Chicago, one of them “isn’t from Chicago,” and he isn’t sure where the other is from. 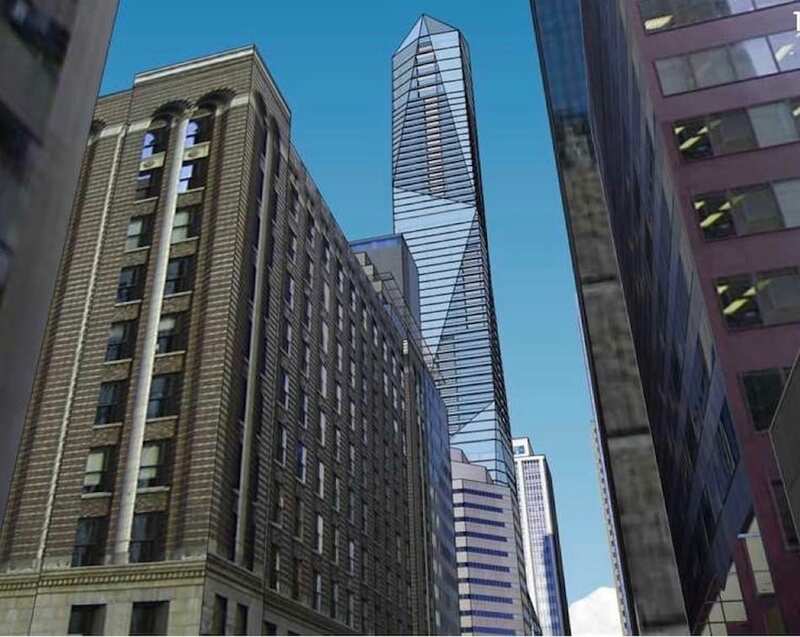 Another perspective for the proposed, but apparently dead, 1,000-foot tower from 17th Street. Image source: Davis Partnership Architects. He described the plans for a 1,000-foot tower, which would be by far the largest building in the city, as a “pipe dream.” He said he is sure that the ultimate buyer will develop something much smaller on the property. The zoning, however, would allow a 1,000-foot tower on the site. 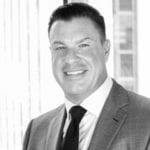 Michael Ursini, a managing principal of Greenwich Realty Capital, said he doesn’t think the deal for the skyscraper is dead and he expects to still move forward on it. Greenwich’s website calls it Sixfifty17. Last month, Denver-based Davis Partnership Architects and Crown Architecture and Consulting submitted a preliminary site plan development for the proposed 1.1 million-sf building to Denver Community Planning and Development. He described the plans for a mixed-use development with a hotel, retail and condos as a $540 million building. “That’s new information to me,” when I told him that Geller said, as far as he was concerned, the deal was dead. Geller said the deal was scheduled to close Feb. 12, but Greenwich Realty Capital wanted a year extension. 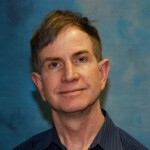 Ursini, however, said it is incorrect to say he wanted a one-year extension. Geller said he already had granted Greenwich 15 extensions. That’s also inaccurate, according to Ursini. Geller, Ursini said, wanted to continue to receive the revenue from the parking lot. Ursini said one idea he wanted to discuss was to start construction on the skyscraper in a year and provide Geller with some revenues until construction kicked off. Ursini said he and his partners already have sunk $3 million of their own money into the development. Ursini said Geller was the most difficult person he has ever worked with during his career. “I’ve never worked with someone as difficult as Mr. Geller in my lifetime, my entire lifetime,” Ursini said. He said the deal didn’t close Feb. 12 because his original partner backed out. However, he said he has lined up another general partner that has the financial horsepower to make the 1,000-foot tower a reality. Shown is the parking lot at 650 17th St. that is back on the market with an asking price of $17.5 million. He said despite what Geller told me, he is hopeful that the land purchase will be completed and he will develop a 1,000-foot tower on the site. That would tower over the 56-story Republic Plaza, the tallest building in the state. He said he is not surprised that other buyers are interested in buying the property because it such a prime piece of real estate. “But talking to people about putting it under contract and closing on the land are different things,” he said.